St Andrew’s is a friendly, welcoming church based in Birchgrove, Cardiff. All are welcome to join us for any of our services, groups or events. We are situated close to M4 links and the A470 into Cardiff and a short distance from Heath Hospital and student accommodation on North Road in Cardiff. Feel free to contact us with any questions or comments you may have. 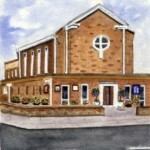 St Andrew's Methodist Church, Cardiff updated their profile picture. St Andrew's Methodist Church, Cardiff updated their cover photo.